Cars, turtles and princesses caught the eyes—and squeals—of children across the U.S. last year, helping to boost sales of licensed toys across the country, according to data by The NPD Group. The research firm reported on Monday that sales of licensed toys rose 3 percent to $5.3 billion in 2013, with movies such as "Cars," "Frozen," and "Teenage Mutant Ninja Turtles" among the top licenses. The segment accounted for 29 percent of total bricks-and-mortar toy sales, and 23 percent of online sales for the category. 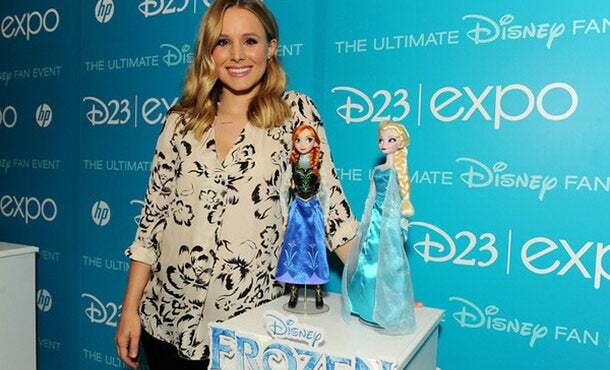 Kristen Bell, who played Anna in the blockbuster film "Frozen," poses with Anna and Elsa "Frozen" singing dolls during the D23 Expo--The Ultimate Disney Fan Event--last year in Anaheim, California. It represents a bright spot in the overall toy category, which saw sales decline 1 percent to $22.1 billion last year. "Children respond to the characters that are brought to life in animated movies, and the prevalence of those movies in 2013 clearly had an impact on sales of related licenses," NPD said in a release. The firm noted that 2014 is also off to a solid start for licensed toys, thanks to Disney's hit movie "Frozen," which led the segment in the first quarter. Disney said in its first-quarter earnings report in February that demand for "Frozen"merchandise continues to drive strong sales. "I would say 'Frozen' items were the single-most demanded items at Disney Store," CEO Robert Iger said in the company's conference call. That demand has, in some cases, led to frantic searches from desperate parents. Earlier this month, NBC News reported that the supply of "Frozen" goods did not meet the heavy demand, resulting in eBay listings of more than $1,000 for the official blue dress worn by Princess Elsa in the film. Other top licenses in the first quarter included Mickey & Friends, "Star Wars," "Teenage Mutant Ninja Turtles" and Disney princesses, NPD said.